This new organ of 23 stops, completed just prior to Thanksgiving, 1992, is installed in the church’s rear balcony. 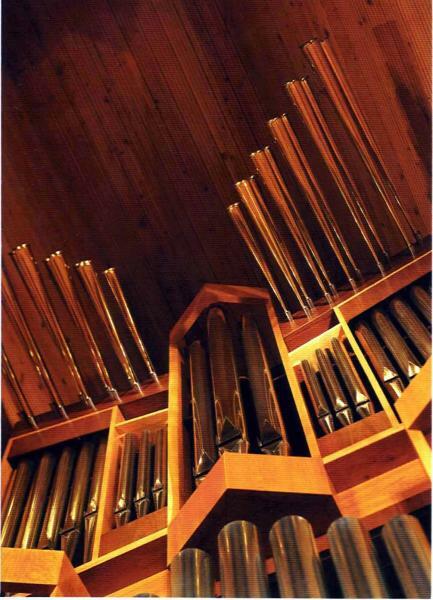 The selection of stops and style of voicing provide for appropriate rendering of a wide variety of musical styles; the scaling is uniformly generous to provide warmth and body in the church’s somewhat close acoustical environment. The new organ replaced an aging electronic immitation. The free-standing case and console are made of white oak with walnut accents, finished in clear lacquer. The impost is joined together in the corners by giant box joints which, in itself, provides subtle visual interest. Panels on the console and case pedestals are made of solid white oak with “ship-lap” joints between the individual planks. An interesting feature of the case is it base. The balcony’s stairway is centrally located, and the view of the front of the church the choir members see when entering the balcony is quite dramatic. The organ committee expressed interest in maintaining this visual feature. Therefore the entire organ is supported by two pedestals with four-foot wide walkway in the center. The choir walks through the organ, if you will, to take their places. The main wind trunk supplying wind to both sides of the organ is incorporated into the “ceiling” of the walkway’s casework. One pedestal houses the winding system, the other houses the electrical switching system. The Great division is located at the top of the case with the Swell below and pedal divided on either side. Front pipes of polished 75% English tin are from the Great Principal 8′, Pedal Octave 8′, and the Great/Pedal Gedeckt Pommer 16′. The wooden front pipes are the tenor octave-and-a -half of the Pedal Subbass 16′, made of Honduras Mahogany, stained with red dye. The case stands about 26 feet high and is 22 feet wide and about five feet deep. The horizontal Trumpet is made of brass, of large scale with flared bells, harmonic length from C25. The organ utilizes electric-slider action, in deference to the Church’s desire to move the console from time to time. The Great and Pedal is voiced on 3″, the Swell is on 4″, the low 18 notes of the Pedal Posaune on 4 1/2″, and the Trompette en Chamade is voiced on 9″ wind pressure. Console registration is by drawknobs, located in terraces on either side of the manual keyboards. Interdivisional couplers, also drawknobs, are located on the nameboard. Pedal division drawknobs are made of ebony, manual drawknobs are of walnut, coupler drawknobs of cocobolo turned of our own design. The organ’s compass is 61/32; this instrument is Opus 9 of the Buzard Organ Company.